Are you looking for a new perspective on how well informed consumers decide what to buy, from who and when, this is a must read - the Zero Moment of Truth by Jim Lecinski. 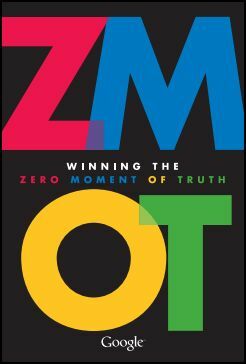 Winning the Zero Moment of Truth is a powerful new eBook by Jim Lecinski, Google's Managing Director of US Sales & Service and Chief ZMOT Evangelist. Jim shares how to get ahead at this critical new marketing moment, supported by exclusive market research, personal stories, and insights from C-level executives at global leaders like General Electric, Johnson & Johnson, and VivaKi. I am finding it fantastic! !